Small campers are a great way to up your camping game without also needing a huge rig or tow vehicle. 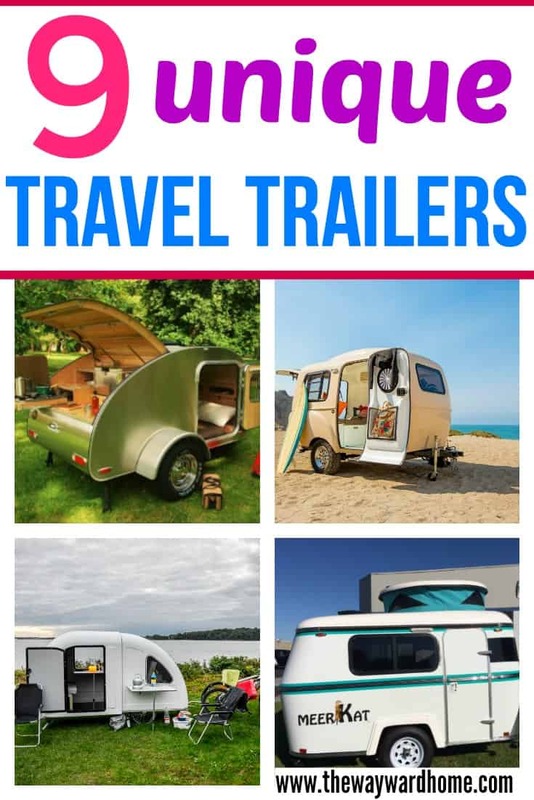 These small travel trailers have all the comforts of home – a bathroom, a kitchen, a sitting area, a bed – but are light enough to tow with a small or medium-sized vehicle. That means better gas mileage and easier storage. Some of these even fit right in a normal garage! Plus, who can possibly resist the cuteness of a small camper? 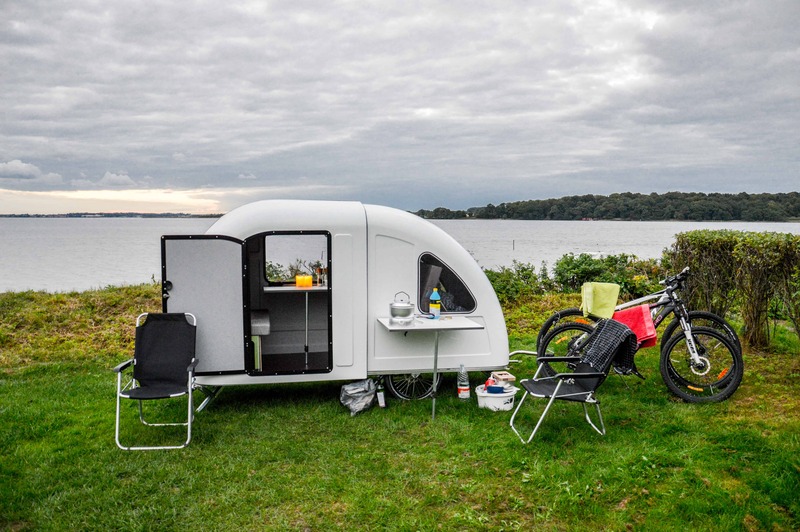 From retro-style travel trailers, to teardrop trailers, to even a tiny travel trailer you can town with a bicycle, they all have a unique look and style. 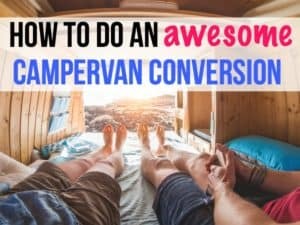 Do you love RVing and van life? Check out our free Facebook group community. 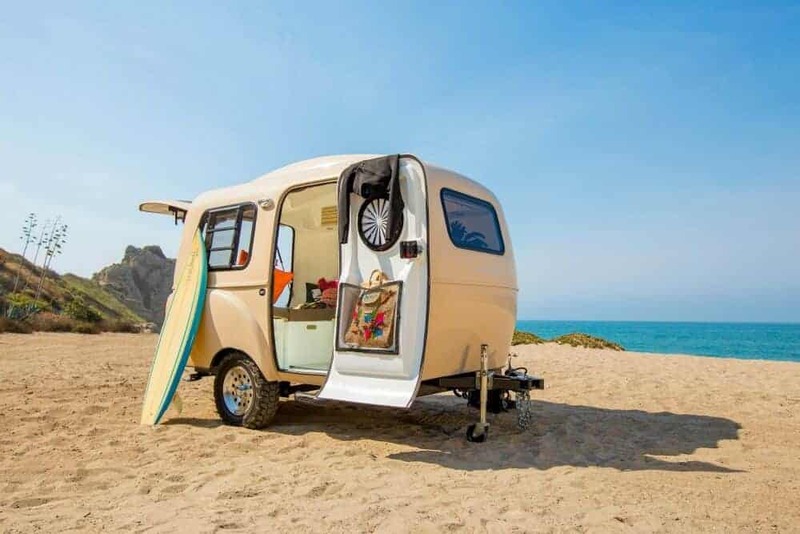 These retro-inspired small campers are built in Los Angeles and have a 100% customizable interior. You can easily configure the modular interior to suit your needs in a matter of minutes – to camping, to hauling, to a guest room, to a pop-up office. 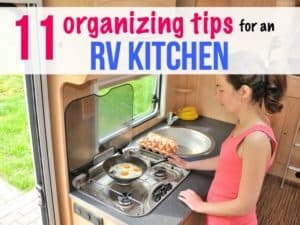 You can even take the components outside the travel trailer if you want to set up a little outdoor experience. Happier Camper Travel Trailers are made out of fiberglass, and you can choose from a range of add-ons, from a toilet, to an inverter, to a fridge or a stovetop. 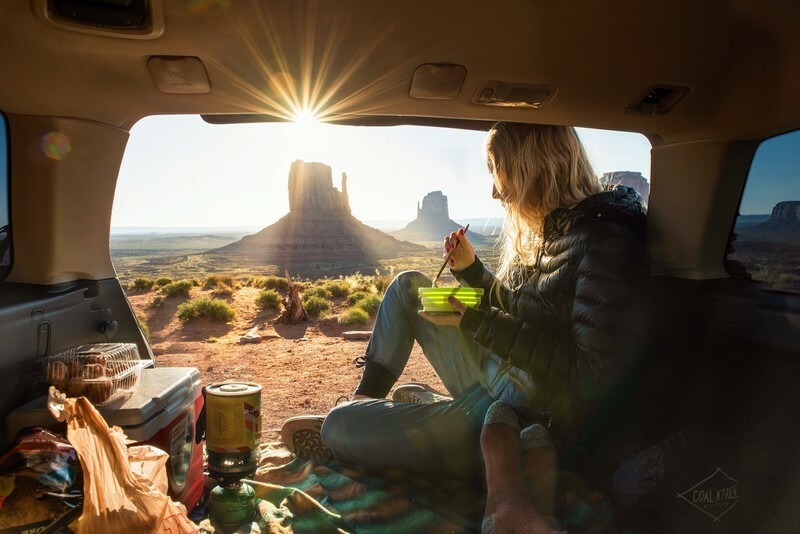 Each add-on increases the weight and cost of your camping trailer, but luckily, you can pick and choose what exactly you’ll need. This handy small travel trailer can be towed by most vehicles and can fit in most parking spaces and garages. 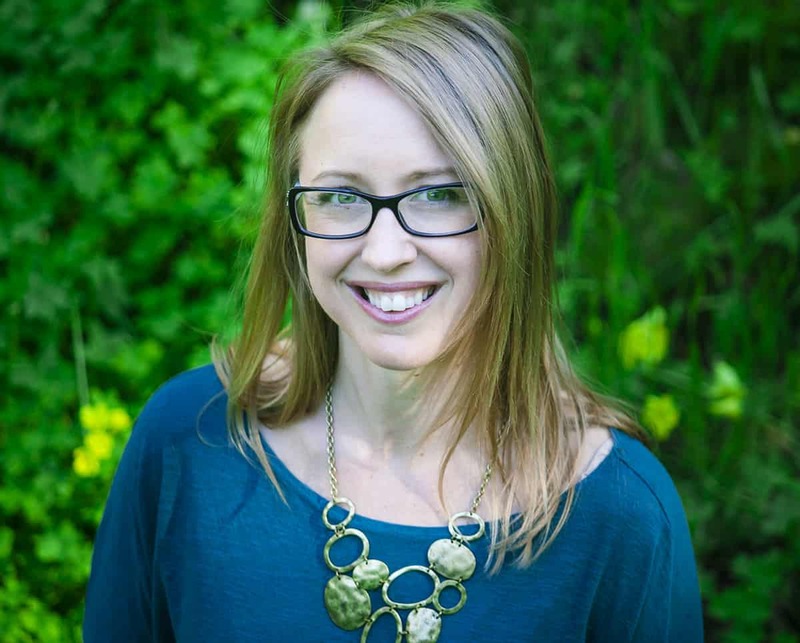 Learn more about Happier Campers here. 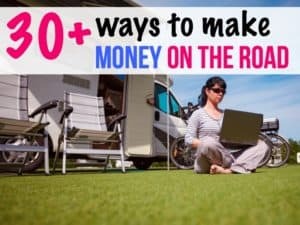 Want to know what’s amazing about the American Dream Travel Trailer? It’s a trailer – and a boat – in one! This small camper is truly dinky with a 4×8 frame. It sleeps two and includes a cooking and storage galley in the rear. The American Dream Travel Trailer is pretty basic inside with a convertible bed/couch, but you can easily customize colors and a variety of add-ons, such as a roof rack or a roof vent. The boat fits on top of this travel trailer; perfect for someone who loves camping near lakes. 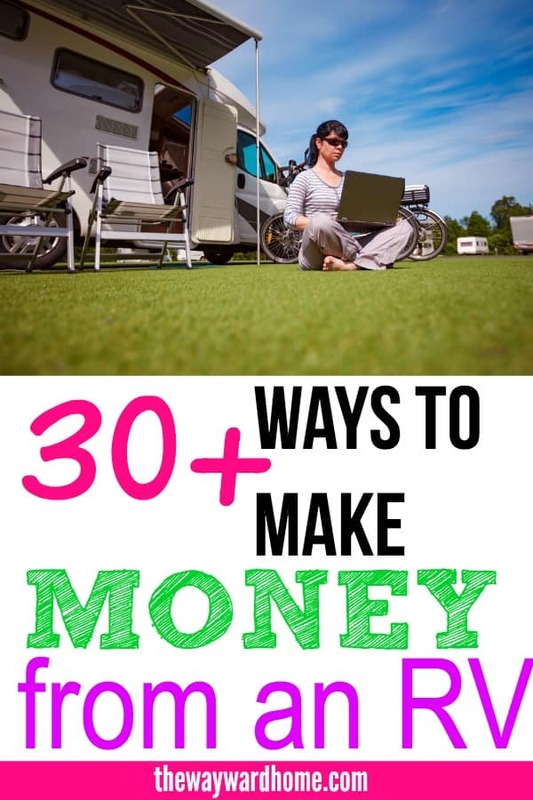 Learn more about the American Dream Travel Trailer here. 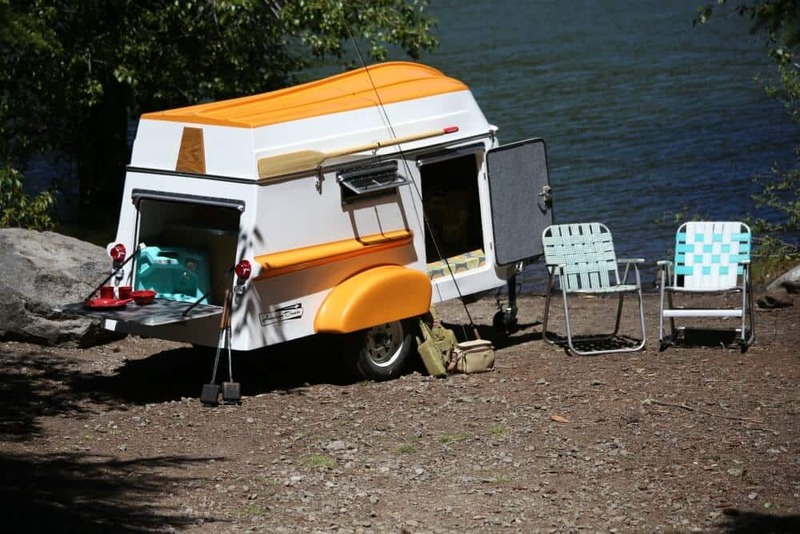 This adorable small camper trailer by Casual Turtle Campers is way too cute to pass up. Lightweight and durable, The Hatchling looks like a cozy cabin on wheels. Left empty, this small travel trailer can accommodate a full-size bed with room to spare, or can be built-out with a custom interior. These lightweight campers can be towed by a variety of vehicles, and are lovingly handmade out of red cedar in Fort Collins, Colorado. Learn more about Castle Turtle Campers here. 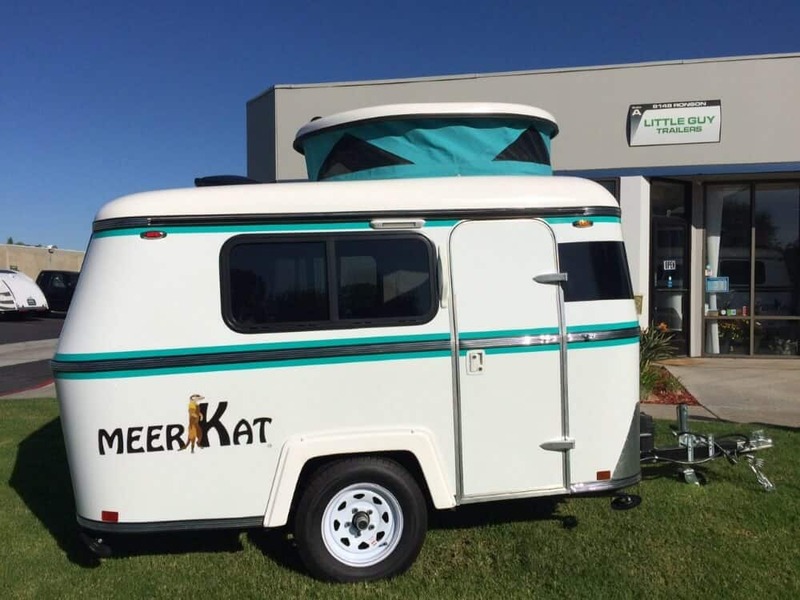 The Meerkat is a small camping trailer that can be towed by just about any car, thanks to its lightweight build. Inside the trailer, you’ll find stand-up headroom, a porta-potty, sink and an icebox. Plus, the bed turns into a table and bench seats when not in use, so you can read, hang out, or get some work done while on the road. It’s a basic little trailer, but can fit into a standard garage. Learn more about The Meerkat here. Taxa Outdoors is known for creating adventure campers, and The Cricket is no exception. This small camper with a pop-up tent roof is lightweight and rugged, and can be towed by most 4-cylinder vehicles. 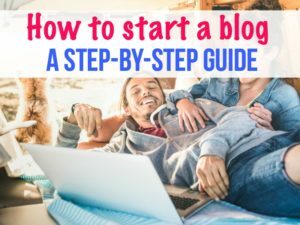 Want to go off-grid? No problem! 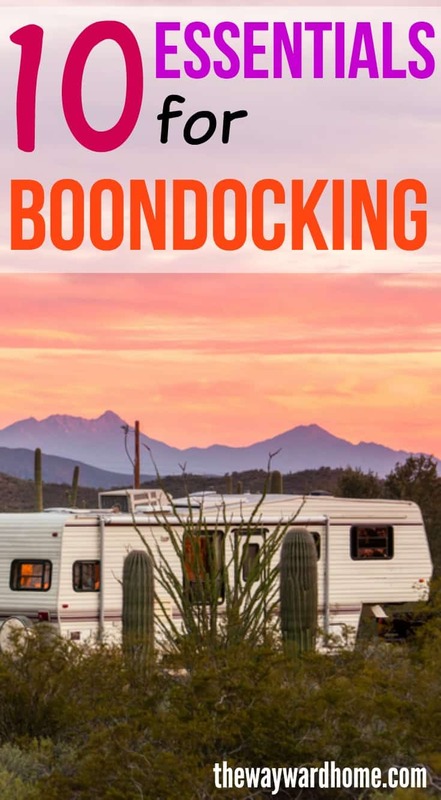 The Cricket has integrated plumbing and electrical systems, meaning you can go boondocking for days. The Cricket can fit two adults and two children, and comes with a marine-grade wood kitchen and storage, vent fan, USB charging ports and a Dometic stove and sink combo. Learn more about The Cricket here. This customizable teardrop travel trailer is built with fine wood and enamel-baked aluminum siding. You can choose your own color and style when you order one of these small camping trailers, which feature a fully-insulated cabin to keep wind, heat and cold out. The back of this trailer pops up to expose the galley, complete with a sink, faucet, LED lighting and optional stove and custom-made cooler. The classic package for this teardrop trailer comes equipped with a Maxxair vent fan, storage cabinets, a queen bed, a 100 amp hour deep cycle battery, and power outlets. 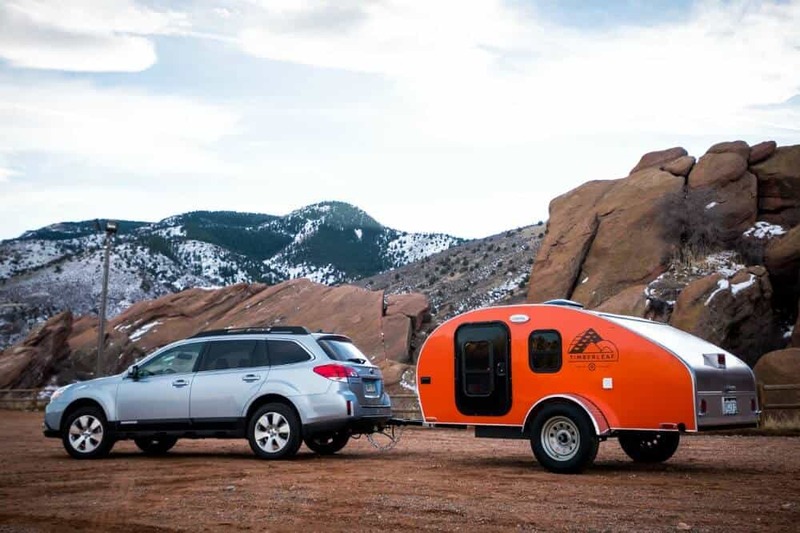 Learn more about the Classic Teardrop Trailer here. The rugged and small Basecamp travel trailer fits two people and is made for the adventurer. 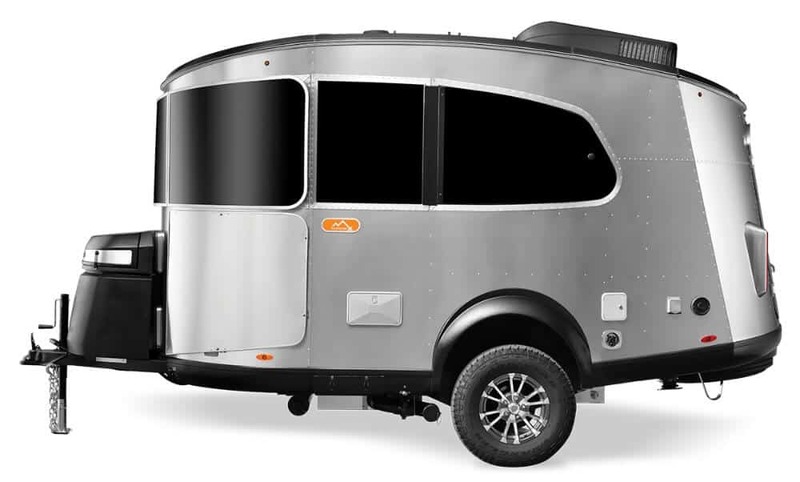 These camping trailers are built out of the same riveted aluminum structure as Airstream’s traditional travel trailers, but have an aerodynamic body and roof. Plus, a panoramic window gives you a view of all that beautiful nature around you. The Basecamp comes with a kitchen, bathroom with a porcelain toilet and shower, and sitting area that converts into a bedroom. Learn more about the Basecamp Travel Trailer here. Highcamp Travel Trailers are a classic teardrop design with a pop-up galley in back. 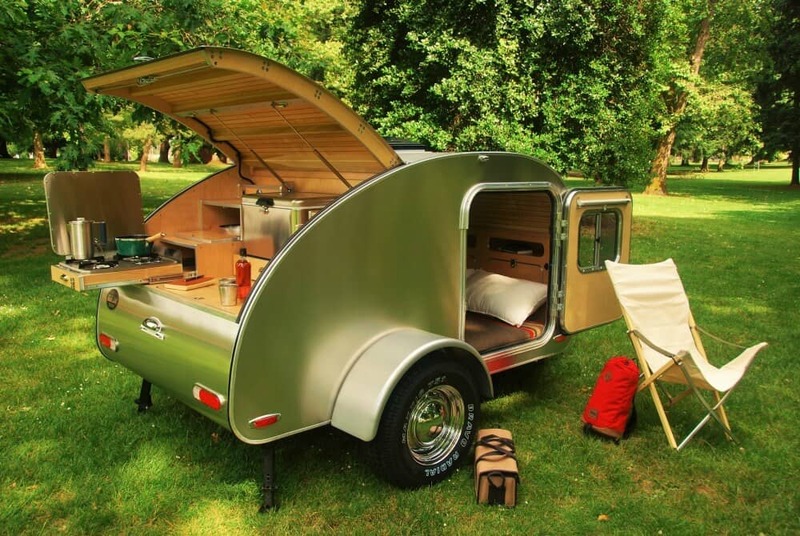 These small camping trailers are handcrafted in Portland, Oregon, and feature a beautiful wooden cabin design. The galley is complete with a pull-out propane burner and Coleman cooler, with plenty of counter space for cooking in the great outdoors. Highcamp prides itself by taking the time and effort necessary to completely finish its trailers with high-quality materials. Learn more about the Highcamp Teardrop Trailer here. A list of small travel trailers wouldn’t be complete without including a tiny bicycle camper! This itsy bitsy camper includes a sitting table, bed for two and a storage room. It’s made out of light wood furniture with gray cushions and gray walls. This camping trailer is perfect for a long bike trip and provides shelter and warmth from the elements when you’re on the road. These light-weight campers are durable, collapsible, and can be set up in as little as three minutes. So, grab your bike and go! Learn more about the Wide Path Bicycle Camper here. WANT TO CAMP FOR FREE? Sign up to get a list of 9 apps and websites that help you find FREE CAMPING for your adventures. Success! Now check your email to download 9 resources to help you find free campsites.